The proper serving size of french fries is reportedly only 12 to 15 fries. The cliche “you want fries with that?” is almost a rhetorical question, since french fries are the perfect combination of carbs and grease – and hopelessly addictive. But the nutritional information for these crispy gems is far from impressive. In fact, a study published last year found that, controlling for other risk factors, participants who ate fried potatoes two to three times a week were at a higher risk of mortality compared with those who ate unfried potatoes. Americans consume more potatoes than any other vegetable, eating an average of 115.6 pounds of white potatoes a year, of which two-thirds are in the form of french fries, potato chips and other frozen or processed potato products, according to the U.S. Department of Agriculture. 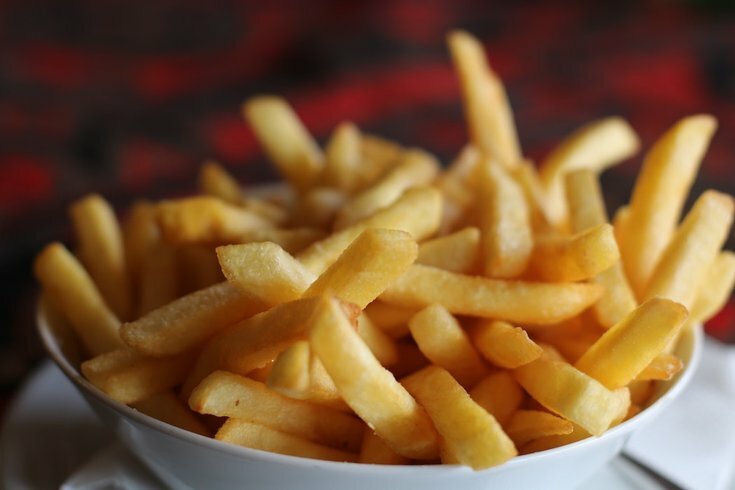 How many fries you eat matters more than things like the fries’ surface area or the type of oil used in making them, Lindsay Moyer, a senior nutritionist at the Center for Science in the Public Interest, told the New York Times. The Department of Agriculture lists a serving of fries as three ounces, which amounts to 12 to 15 individual potato sticks, or about 140 calories. “I think it would be nice if your meal came with a side salad and six french fries,” Eric Rimm, a professor in the departments of epidemiology and nutrition at the Harvard T. H. Chan School of Public Health, told the Times. Elaine Magee, the author of 25 books about nutrition and healthy cooking and a corporate dietitian for the Albertsons supermarket chain, recommended to savor the flavor. Magee also ranked the healthiest types of french fry kinds and cuts. She identified homemade baked fries, baked at high temperature with a sprinkling of canola or peanut oil, to be the healthiest. The least healthy option is a toss-up between waffle and curly fries, since both have greater surface area to absorb oil. The middle ground? Sweet potato fries. While they are certainly not a healthy food by any means, sweet potato fries have more Vitamin A and fiber.